In eastern Massachusetts, on the coastline of the Atlantic Ocean only nine miles north of Boston, you will find the beautiful City of Lynn. Lynn is home to roughly 90,000 residents and is the largest city in Essex County. This culturally diverse, densely populated city is a commercial and urban manufacturing center. Situated on the northern shore of Massachusetts Bay, Lynn is bordered by Revere and Nahant on the south, Salem and Peabody on the north, Lynnfield and Saugus on the west, and the Atlantic Ocean and Swampscott on the east. Around fifty-one miles to the west is Worcester, ninety-five miles north is Portland, Maine, and New York City is only two-hundred twenty-nine miles away. In addition to an exceptional location, Lynn has a long, rich history which parallels that of many other New England communities. This history is well-preserved in its museums, libraries, and historical society. It is also on display at multiple historical sites, one example being the Pine Grove Cemetary. Pine Grove Cemetary is municipally owned and was established in the mid-1800s. Comprised of 250 acres, making it one of the nation’s largest, the cemetery encompasses several historically significant landmarks and features. The Cemetary Office Building, for example, was constructed in 1860. The office is just inside the cemetery's Boston Street entrance, at the bottom of the hill. The Pine Grove Cemetery Receiving Tomb is another highlight. It was built between 1866 and 1868 in the Ruskinian Gothic style. Another interesting feature of the cemetery is the Rhodes Memorial Chapel. Constructed in 1891 in the Richardson Romanesque style, it has experienced multiple renovations and boasts highly-valued stained-glass windows. Furthermore, Pine Grove’s wall, built in the 1930’s by the WPA, is listed in Ripley’s Believe It or Not as the globe’s “second longest contiguous stone wall.” Located at 145 Boston Street, Pine Grove Cemetery was named for the beauitful pine trees that encircle its Chapel and frame its entrance. In proximity to the cemetery, prospective homebuyers will find lovely housing options. Homes for sale near Pine Grove Cemetery include houses of varying architectural styles. Available real estate near Pine Grove Cemetery falls in a broad price range and is in proximity to Lynn Woods, Wyoma Square, and other Lynn attractions. 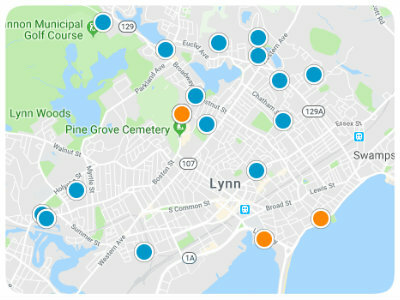 If you would like to learn more about available properties near Pine Grove Cemetery in Lynn, Massachusetts, please contact us so we can assist you.